The leaves may have only begun to turn in color, yet frost is on its way and it’s time to schedule an irrigation blowout! While our winters are typically mild, we often experience cold weather conditions marked by below freezing temperatures. During periods of freezing weather, frost penetrates the soil, compromising your irrigation system’s pipes and components. If water remains in the system, pipes and parts will expand and crack. Before the first freeze, we highly recommend blowing out your irrigation system to prevent costly repairs next year. This should be done every fall to protect your investment. Prices are determined by the number of zones (or stations) in your system. Call us at 360-697-3215 or 253-530-0788 or email info@northwestcl.com or fill out this form to schedule your irrigation blowout. Many homeowners relish the idea of reducing the time it takes to maintain their landscape, and an automatic irrigation system can definitely help in this endeavor. One of the most time-consuming aspects of maintaining a healthy landscape is having to water it by hand. What starts out as a pleasurable outdoor task can quickly begin to feel like a dreaded chore, especially if you have stretches of lawn or a lot of garden beds. Watering your landscape can be done manually with simple tools – a hose and nozzle – or, it can be accomplished with an automatic irrigation system which requires little to no effort at all from the homeowner. In this blog post, we highlight four benefits of an automatic irrigation system. 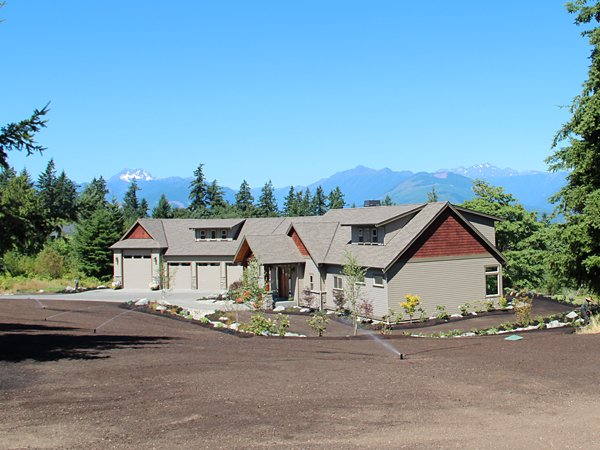 A new irrigation system was a necessary component of this Seabeck landscape installation, which included over 13,000 square feet of lawn. Installing an automatic irrigation system can be monumental for homeowners who no longer want to spend time hovering over their lawn or garden beds with hose in hand. These systems are installed in the ground and are connected to a timer box that is clock-driven. Irrigation timers allow homeowners to schedule their watering to accommodate their preferences and landscape needs. Homeowners have the ability to choose what time of the day their system starts, how long it runs for, and how frequent it turns on. These customizable options help to make this task easier to manage. For those who want to eliminate the guessing game of when and how long to water, smart timers will do the work for you. A smart timer connects to your home’s Wi-Fi and calculates a daily watering schedule based on your particular soil, grass type, sprinkler head type, sun exposure and local weather forecast. So, on hot days it will adjust to produce more water and on rainy days it will not water at all. Over time, this daily calibration saves on water costs because it will only produce water when needed. An added bonus: homeowners have the ability to control their systems anytime and from anywhere in the world using a computer, tablet or smart phone. Brilliant! Are you tired of moving and adjusting your manual rotating sprinkler from one side of the yard to another? Many homeowners understand the struggle of trying to adjust manual sprinklers, targeting just the right spot, only to wind up frustrated and defeated as water ultimately hits wherever it may land. When you choose to go with an automatic irrigation system, your irrigation technician will plan your layout for optimal coverage and make necessary head adjustments once the system is installed. This results in effective watering, saving time, money and unnecessary frustration! Another benefit of installing an automatic irrigation system is that it helps homeowners who plan to sell their home by adding value to their property. A landscape that is easy to maintain and convenient to water are attractive features to home buyers. For homeowners who aren’t planning to move anytime soon, the curb appeal of a good-looking landscape is a beneficial investment. It shows that you take pride in your home and creates a positive impression to neighbors and guests. 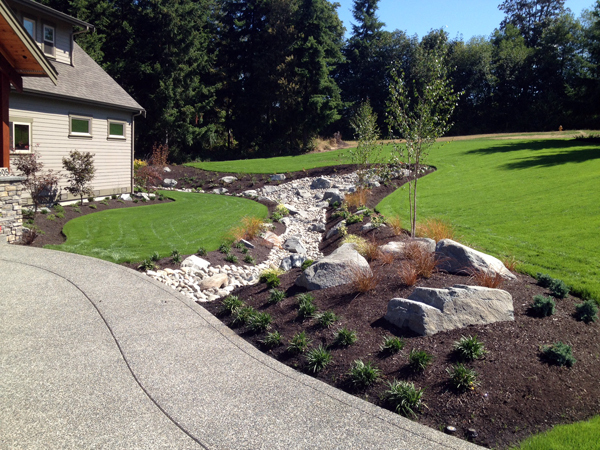 If you are considering installing an automatic irrigation system, we’d love to talk to you about your project. Give us a call or send us an email at info@northwestcl.com and we can schedule an appointment for you to meet with one of our irrigation professionals! 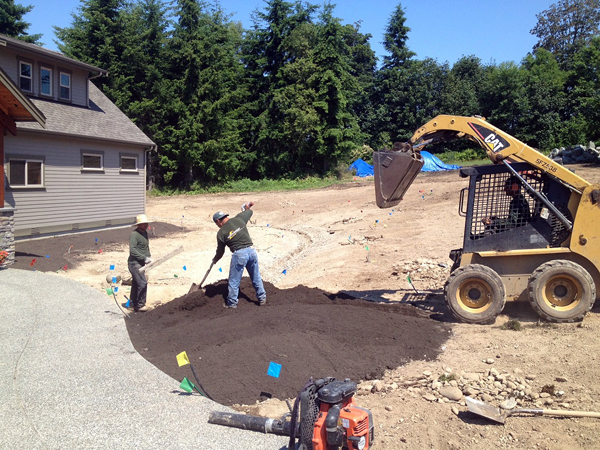 This new landscape installation in Seabeck is one of the largest residential projects we’ve installed to date. 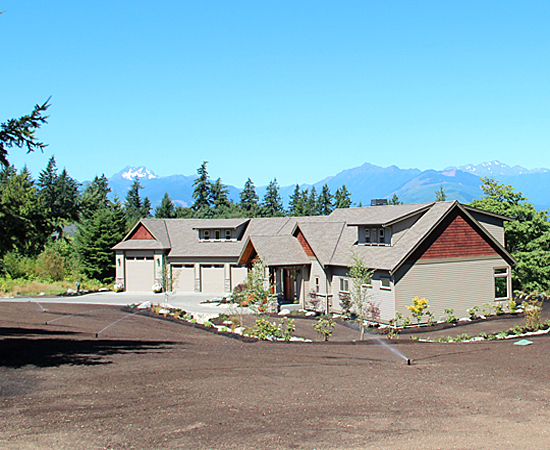 Our clients’ gorgeous custom home was constructed by BK Sargeant Construction, and from their kitchen table and back deck they enjoy a breathtaking view of the Olympic Mountains. Landscape Architect Emily Russell of Russell Design Source designed this landscape, providing a formal to-scale plan to our clients which we were able to easily reference and work from. Never one to impress her design ideas upon her clients, she listened to what they had to say about which features to include in their landscape plan and gave them exactly what they wanted. One of their main concerns was an area that remained saturated after heavy rains due to a natural slope in the landscape. 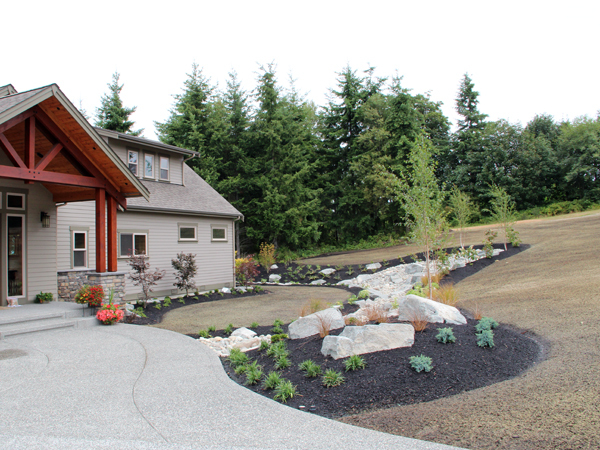 Emily’s design solution was to incorporate a dry waterfall and river rock bed. 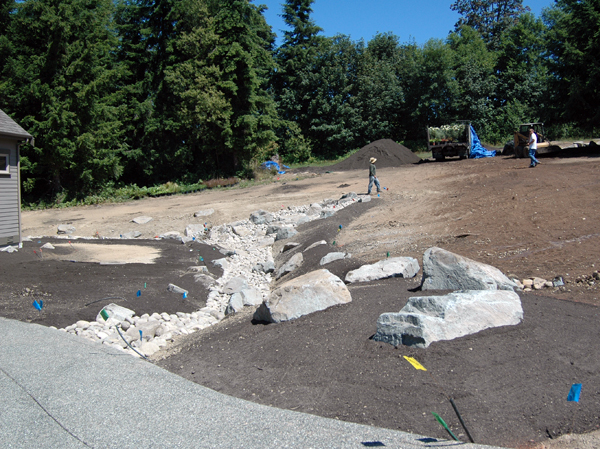 Larger 2-man and 3-man sized rocks were placed throughout the beds and within the river rock bed as well. The dark, nutrient-rich garden mix topsoil you see below was delivered to us from Vern’s Organic Topsoil. Vern’s Organic Topsoil was used for all raised garden beds and lawn areas. 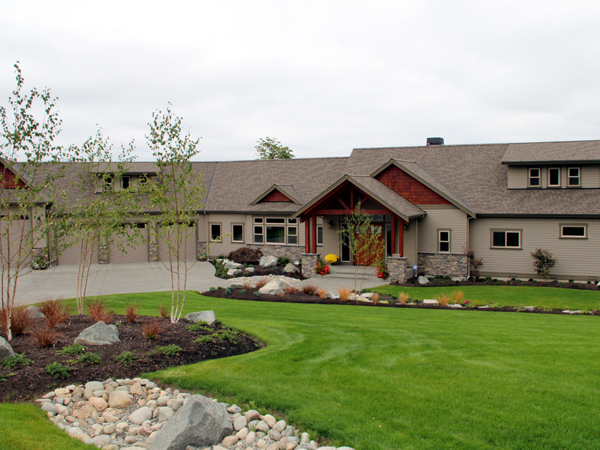 With approximately 13,000 square feet of lawn, installing an irrigation system was an absolute must. Another must for our clients was purchasing a new riding lawn mower! Emily’s plant selection took into account the many deers that inhabit neighboring wooded areas. Though just because a plant is considered to be “deer resistant,” that doesn’t mean it won’t be eaten. Deers will eat just about anything if they’re hungry enough. The plant list included Whitebarked Himalayan Birch, Oakleaf Hydrangeas, Variegated Winter Daphne along with natives such as Oregon Grape Holly and Western Sword Fern. Grass began to grow within two weeks of hydroseed being sprayed, largely due to the endless amount of sunshine we received in late July. The value of working with a Landscape Architect cannot be overstated. 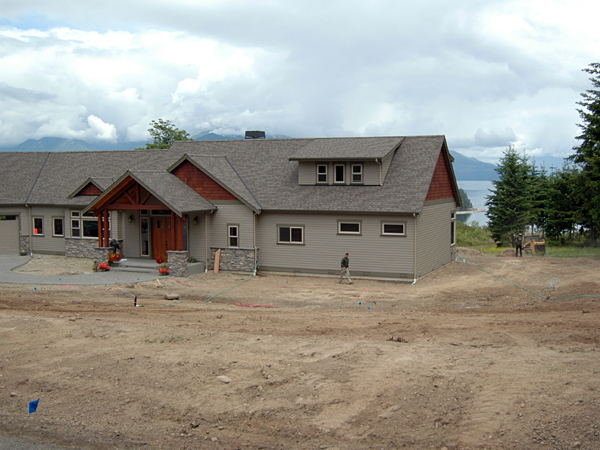 Our clients knew what the end result would look like, even before we arrived on day one. We were able to provide our clients with a 6-week plan and time frame for completion, a deadline which we met thanks to our hot and dry summer. Let us know what you think about this new landscape installation! Log in to Facebook and leave a comment below. More than half of the days in July reported temperatures in the 80s. One way to beat summer heat is to – surprise, surprise – water! Many homeowners make the common mistake of watering too frequently for a short amount of time. Shallow watering may be enough to keep your lawn alive, but results in shallow roots. Deep watering results in deep roots and a healthy lawn that is less prone to disease, insect infestations, or heat stress. At least 1″ of water per week is needed to keep a lawn growing, though during periods of drought, 2″ of water is even better. 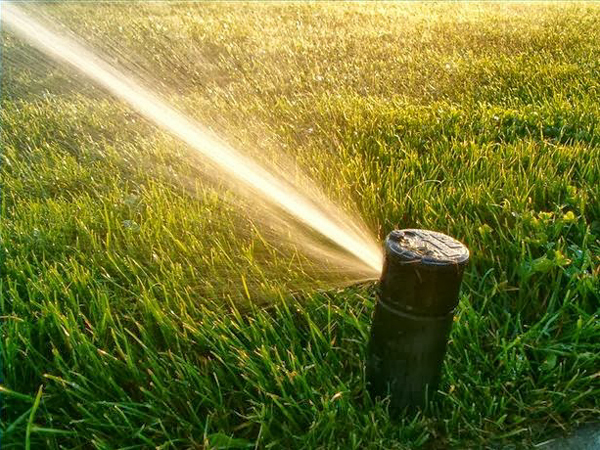 The correct approach is contingent upon your irrigation system and water pressure, as the amount of time necessary to keep the water going will vary accordingly. A general guideline is to water in the early morning 2 or 3 times a week for 20 – 40 minutes. Though if you want to nail it down more precisely, click here for instructions on how to do a tuna can test. As temperatures continue to rise, it’s a good idea to check that your irrigation system is properly functioning so it’s ready when you need it. After all, do you really want to wait until it’s 80 degrees outside to discover that your system has a few broken heads? Didn’t think so! You’ll find a general checklist below. Keep us in mind in the fall when it’s time to blow-out your system. We’d love to hear from you!